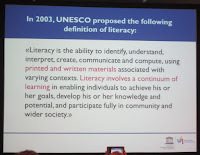 A final post about the Literacy session at the World Library and Information (IFLA) Conference yesterday. Lisa Krolak (UNESCO Institute of Lifelong Learning) talked about Literacy Matters! Literacy as a foundation for lifelong learning. The UNESCO Institute for Lifelong Learning is at http://www.uil.unesco.org/home/ and this is an interesting initiative: I only came across it recently, but it should have relevance for lifelong information literacy initiatives. They have a "Literacy and basic skills" section on the website which notes that "The right to literacy is an inherent part of the right to education. Yet adult literacy is one of the most neglected of the Education for All (EFA) goals". 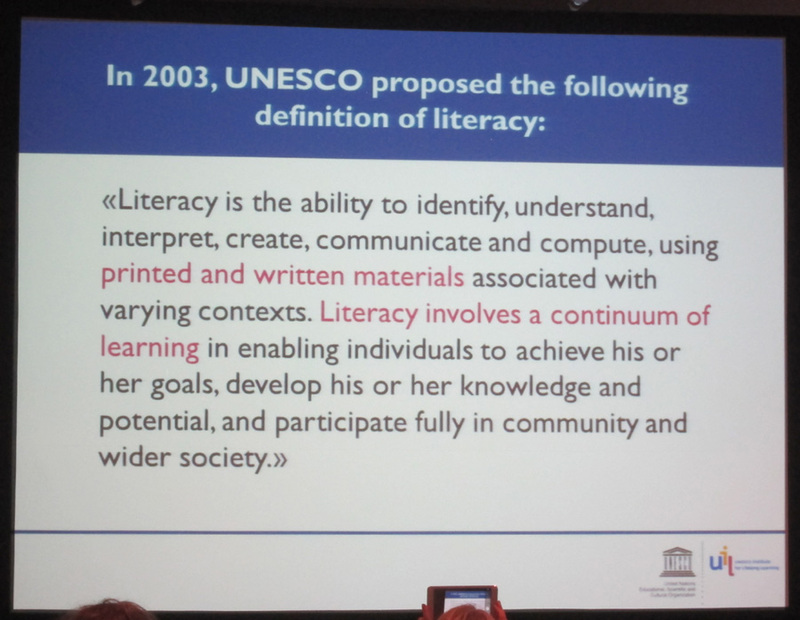 To turn to Krolak's presentation, she explored definitions of lifelong learning and literacy, including UNESCO's 2003 definition of literacy (shown in the photo above). The reference to a "continuum of learning" makes a particular link with lifelong learning. Krolak said that "Literacy, as a human right, lies at the heart of basic education and is the foundation for future learning opportunities". She saw literacy as a continuous life-wide and lifelong process and identified the need for development on five fronts. These were: laying down strong foundations through early childhood care and education; universal good quality basic education for all children; "scaling up and reaching out with relevant literacy provision for all young people and adults"; developing literacy-rich environments and a literate culture; dealing with root causes of illiteracy (e.g. poverty). She mentioned a programme at Vancouver City Libraries, but I haven't been able to track down a link for that yet. Krolak highlighted a just-published special issue of the International Review of Education: Journal of Lifelong Learning focusing on lifelong literacy: volume 61 issue 3 at http://link.springer.com/journal/11159/61/3/page/1 (priced publication). It includes articles on Literacy in the 21st century: Towards a dynamic nexus of social relations; Lifelong literacy: Some trends and issues in conceptualising and operationalising literacy from a lifelong learning perspective; Learning and literacy: A research agenda for post-2015; and (coauthored by Krolak) The potential of community libraries in supporting literate environments and sustaining literacy skills. During her presentation, Krolak showed this nice video, on the Power of Literacy. She identified it as demonstrating some of the characteristics of literacy learning, for example that it takes place in various life contexts, and that emotional engagement is important.